This is a help file which explains how to use this site and board. First of all, this site deals ONLY with African and Russian/Ukrainian scammers with fake identities. Those are scammers whom you NEVER met in person, who pretend to be whom they are not, with fake identities, scamming over the Internet. We DO NOT DEAL WITH: pro-daters, gold-diggers, gigolos, green-card seekers, perverts and other kinds of nasty people whom you meet face to face. While this type of behavior is certainly disgusting, this is NOT what this site is about. Besides, this more like a moral problem, while scamming is a legal problem, we are fighting CRIME. We also don't deal with fake and dishonest marriage agencies and Russian brides websites. There are other sites out there who specialize in that. Romancescam is ONLY about scamming individuals, not companies. The cases when you accuse a real person whom you met face to face of being a scammer should be handled by the authorities, not by Internet forums. Our Asian section is also being deprecated, if you ran into an Asian scammer, please go to this site: http://www.dragonladies.org" onclick="window.open(this.href);return false; register and post there. Secondly, we list scammers AND their fake profiles. This means that one doesn't necessarily have to sit and wait to get scammed, lose money or wait for a money request, and only then post a scammer. However, you have to have a sufficient proof that a fake profile belongs to a Nigerian or Russian scammer, and not to a perv or bored youngster. For that purpose, you have to get in contact with the owner of a fake profile and obtain some details, like their IP address. This site is organized by pictures. 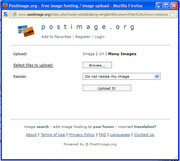 This means a scammer or scammers using the same set of pictures go into the same photo album and the same forum topic, even if there are different scammers using this set of pictures. The pictures, even old ones, get re-used by different scammers all the time. This grouping keeps the site somewhat compact. There are still hundreds of pages, but if we grouped them by every new instance of name or e-mail, it would be thousands of pages. Click on a little camera icon and upload a picture of your scammer. As for Tineye, it DOES NOT index pictures posted in our forum, only Google does. You might also want to add words "romancescam" in the Google text query box. If you located the pictures and the corresponding forum topic, please add your info to this topic. DO NOT start a new topic if these pictures are already listed and topic exists. If you cannot locate the picture of your scammer on this site, than you can start a NEW TOPIC in forum about your scammer. Before you start, please choose the appropriate forum section. - General Discussion -> Voting polls - This is where you can create your voting poll. Please make sure it is interesting for everybody, not about some particular scammer, like "do you know him", or "is he a scammer". In other sections the voting polls are not allowed, as they detract attention from reports. TO START A NEW TOPIC. Once you found the appropriate section, please click on "New Topic" button. This will open a popup window, where you can browse and locate a picture on your PC and add it. After you click "Upload It", the window will close, and a code with your picture will be added to the post. Don't alter this code, or the picture will not show up properly. After you are done typing your message and adding your picture, you can preview your message by clicking on "Preview" button. If everything looks OK, you can post by clicking the "Submit" button. Before pressing "Submit", make sure you unchecked the line "Disable BBCode in this post". We need BBCode. Without it your pictures will not show up! You can also make sure this line always stays unchecked by going to your Profile and selecting "Yes" on "Always allow BBCode". That's it. Now you can post your message! WARNING: Please do not reply by using the "Quote" button!!!! Unnecessary quoting is clogging up the database, making the board harder to read and there is no need to repeat what has been said already. Only quote if you are addressing something to somebody, and then only use the lines you are replying to. Please erase all unnecessary lines when you craft your reply. ** DO NOT TELL SCAMMERS THEY ARE LISTED HERE!!! Those who do will be banned from this site. 1. Members must not point any scammer to this site. Anyone found doing so will have their account closed. 2. Do not use obscene or offensive language, words and phrases as well as their euphemisms. 3. Members should not abuse or insult anyone, directly or indirectly; express disrespect for the forum members. 4. Members must never post messages that can violate law. 5. Advertising, naming or soliciting any products, websites, services, funds or donations in messages, signatures, usernames or avatars without exclusive permission of the administration are strictly prohibited. If you join the site to report a dating site, do NOT use their name in your username as this can result in your account being suspended. 6. Contacting a member of the forum in an attempt to persuade them to join another group or community, or as a deliberate means to discuss forum matters away from the forum is forbidden. Anyone found doing this will have their account closed. It should also be said that requesting member information off site is akin to a scammer luring a victim off the dating site and should not be tolerated. Members who have been solicited as such should report the matter to a moderator or admin. 7. Do not create threads devoted to questions that are already answered in the FAQ. 8. Members should use an appropriate, descriptive title when posting a new topic. Do not create meaningless titles such as ("Help", "Is this a scammer? ", "Urgent" etc.). 9. Flaming is not allowed. Do not create topics that are irrelevant to the forum, or posts that are irrelevant to a topic. 10. Members found to be posting information in an attempt to defame another person's character will have their account closed. 11. Members should avoid posting flooding messages that are meaningless in the current context. 12. Do not use links to off topic sites in your signatures. 13. No all-caps (FOR EXAMPLE, LIKE THIS), or mixed-case or "all-bolds" are allowed. This includes the malicious use of excessive formatting to draw special attention. 14. Wilful moderating (aka "backseat modding") is prohibited. Members that are not moderators must avoid reproving other members. 15. Members should avoid discussing or speculating upon penalties imposed by moderators or administrators. 16. Members are only allowed one account. Do not sign up for a new account if you forget your old one. Use the password retrieval option instead. 17. Proxies are no longer allowed on this site. If you sign up to, or post on this site using a proxy then your account will be deleted. 18. Members have to make at least one post before they can use the PM system. Making a post purely to circumvent this rule is not allowed and will cause the person to be banned. Likewise, trying to circumvent the system that only allows a person to post in our "dating sites" section will cause the account to be banned. 19. 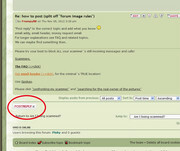 Information posted on the forum becomes the intellectual property of romancescam.com. The use of any information found on this site elsewhere, under any form of media ,without the express permission of the site owner is prohibited. 1. Do not use avatars that exploit political or religious matters. Administration reserve the right to delete them after notifying the member via PM. 2. Do not create threads of political or religious nature. Administration reserve the right to delete these threads without prior notice. 3. Do not make overly large signatures. Anything that causes forum "blowout" will be deleted. 4. Do not add links to other sites in your sigline. Any found will be deleted and, depending on the content of the site in the link, the member risks having their account terminated. 5. Never bring the thread up repeatedly if your question is not answered. Otherwise, such actions may be considered importunate and flooding. 1. Use search. Read FAQ. It is likely that your problem has already been discussed earlier. This will save your and other members' time. 2. Be grammatically correct. Spell check your messages before posting them. Do not use "am" instead of " I am". 3. Avoid excess quoting. This embarrasses reading and congests a thread. 4. Please refrain from posting private correspondence in public areas. This will be considered off topic. Use PM instead. 5. Do not copy contents of verbose web pages to your posts. Instead, use links. 6. Do not post meaningless messages just to say something. 1. Administrators and moderators reserve the right to edit, move, close or delete threads and posts that do not comply with the forum regulations. 2. Administrators and moderators have the privileged right to interpret the forum rules in the event that forum members report about ambiguity in any of the clause of the forum rules. 3. Administrators reserve the right to change any member's status as they deem necessary. 4. Members have the right to appeal against moderator actions taken against them. Any appeal should only be lodged with the site administrators and must be made using private message (PM). 5. In all cases, the decision of the administration is final. The rules shown here may be amended at any time by the administrators of the forum with no prior notification. Last edited by Marisa on Tue Feb 26, 2013 7:41 am, edited 5 times in total. revised and edited - 1-June-2012.